This document has been archived and replaced by NSF 19-535. A newly established co-funding relationship between the NSF Directorate for Biological Sciences (BIO) and the National Research Foundation (NRF) of South Africa will support U.S. - South African collaborative projects. The Directorate for Geosciences is not partnering with the Directorate of Biological Sciences in this solicitation. Therefore, proposals that investigate marine biodiversity and/or marine environments, whole or in part, are no longer eligible, and if submitted will be returned without review. This campaign promotes novel integrative approaches to fill the most substantial gaps in our understanding of the diversity of life on Earth. It takes a broad view of biodiversity, and focuses on the intersection of genetic, phylogenetic, and functional dimensions of biodiversity. Successful proposals must integrate these three dimensions to understand interactions and feedbacks among them. 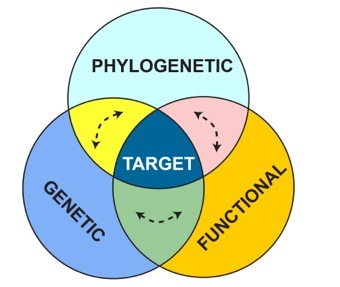 While this focus complements several core programs in BIO, it differs by requiring that multiple dimensions of biodiversity be addressed simultaneously, in novel ways, to understand their synergistic roles in critical ecological and evolutionary processes, especially pertaining to the mechanisms driving the origin, maintenance, and functional roles of biodiversity. The Dimensions of Biodiversity program includes partnerships with the National Natural Science Foundation of China (NSFC), the São Paulo Research Foundation (FAPESP) of Brazil, and the National Research Foundation (NRF) of South Africa in fiscal year 2018. NSF anticipates that at least $10,000,000 will be available in fiscal year 2018. Research awards will be up to five years duration and up to a total of $2,000,000 for both individual and collaborative projects. This upper limit does not include costs of NSF facilities. Up to two US-China Collaborative Research Project awards will be funded at a level of up to $2,000,000 over 5 years from NSF plus up to ¥3,000,000 from NSFC. Up to two 5-year US-São Paulo Collaborative Research Project awards will be funded by NSF to the US components and by FAPESP (São Paulo Research Foundation) to the São Paulo components. NSF will fund its US researchers at a level up to $2,000,000. FAPESP will fund Thematic Project investigators at a level up to the equivalent of $2,000,000 (this total value includes both the overhead for researcher direct use and the overhead for institutional infrastructure) and Young Investigator Award researchers at a level up to the equivalent of $1,500,000 (this total value includes both the overhead for researcher direct use and the overhead for institutional infrastructure). Please note that for Dimensions of Biodiversity competition only, FASESP will consider Young Investigator Award proposals with a duration of 5 years. Up to two 5-year US-South Africa Collaborative Research Project awards will be funded at a level of up to $2,000,000 over 5 years from NSF plus up to 10,000,000 Rands from NRF. An individual may appear as Principal Investigator (PI), co-PI, or other senior personnel on only one proposal per annual cycle submitted in response to this solicitation. This limitation includes proposals submitted by a lead organization, any sub-award submitted as part of a proposal, or any collaborative proposal submitted as separate submissions from multiple organizations, and this includes all types of projects (including US-China, US-BIOTA-São Paulo, and US-South Africa). The Dimensions of Biodiversity program currently targets three fundamental dimensions of biodiversity - genetic diversity, phylogenetic diversity, and functional diversity. Integration across these three dimensions is an essential aspect of all proposals. Genetic diversity includes genetic, genomic, transcriptomic, and proteomic diversity. Phylogenetic diversity refers to reconstructing evolutionary relationships among lineages at and above the level of the population and how these relationships inform taxonomic understanding. Functional diversity refers to the roles that organisms play within populations, communities, and ecosystems, including the regulation of ecological processes and the role of key innovations in the generation and maintenance of biodiversity across spatial and temporal scales. Investigators must study the dynamic relationships among these three dimensions and their associated feedbacks (Fig. 1), and seek to understand how these relationships and feedbacks change and evolve over time. Because a primary goal of the program is to describe the largest unknown mechanisms driving the origin, maintenance, and functional roles of biodiversity, proposals that have the potential to fill large gaps in our understanding of biodiversity are particularly encouraged. All projects must ensure that data and biological materials are collected, archived, digitized, and made available using methods that allow current and future investigators to access data to address new questions. Funded projects must disseminate project data broadly, using widely accepted electronic methods. Data publication via existing repositories (e.g., Genbank, Dryad, iDigBio, MorphBank, Open Tree of Life) is strongly encouraged. All projects will be expected to adhere to appropriate standards where they exist (e.g., for taxonomic, geospatial, ecological, gene and genome sequence data) and to identify and maintain data linkages across repositories where possible. As a condition of funding: any digitized data and/or digital media (e.g., images, audio files) of voucher material from the project must be made available through the online National Resource for Digitized Collections (iDigBio.org); and, any phylogenetic character matrices and trees must be formatted and deposited for inclusion within the Open Tree of Life (see https://blog.opentreeoflife.org/data-sharing/ for instructions). Proposals should focus on fundamental aspects of biodiversity research; those whose primary focus is applied in nature (e.g., food and drug development; biomedical prospecting; restoration, or biodiversity management) are not eligible for funding. Projects that integrate multiple dimensions of biodiversity but largely repeat or replicate existing work will also not be funded. Additional examples of proposals that will not be considered by this program include: 1) projects that address only the characterization of genetic diversity within a single population or species; 2) projects that focus on species surveys, discovery, inventories, or descriptions (including projects that solely focus on large-scale sequence acquisition, for example microbiome surveys, without integrating the three dimensions of biodiversity); 3) projects that address only taxonomic boundaries (e.g., species delimitation) using genetic markers; 4) phylogenetic and/or phylogeographic studies that do not also address the genetic and functional aspects of the focal group(s); and 5) projects that focus wholly, or in part, on marine biodiversity and/or marine environments. NSF has agreements with: the National Natural Science Foundation of China (NSFC) to jointly support U.S.-China International Research Projects, the State of São Paulo Research Foundation (FAPESP), Brazil to jointly support U.S.-São Paulo Collaborative Research projects, and the National Research Foundation (NRF) of South Africa to jointly support U.S.-South Africa International Research Projects, as described below. These agreements do not preclude other international collaborations. For FY2018 the US-China partnership will support research projects that integrate the three dimensions of biodiversity as described in this solicitation. The deadline for NSFC is 2 March 2018. For US-China Collaborative projects, NSF will fund up to $2,000,000 to support the activities of US researchers and NSFC has agreed to provide up to ¥3,000,000 to Chinese participants. The proposal budget submitted to NSF should include only the costs of US participants; the anticipated budget for Chinese participants should be submitted as a supplementary document. For FY2018 NSF will continue the partnership with the São Paulo State Research Foundation (FAPESP) of Brazil to facilitate coordinated funding of up to two US-São Paulo Collaborative Research projects. These projects can focus on any topic that falls within the scope of this Dimensions of Biodiversity solicitation and the corresponding FAPESP- BIOTA call for proposals published at http://www.fapesp.br/biota/dimensions-NSF2018. These projects must have a 5-year duration and should take advantage of the unique and innovative opportunities offered by an international collaboration. The deadline for FAPESP is 28 February 2018. São Paulo state researchers applying to FAPESP under this heading must meet FAPESP eligibility requirements and must apply through an institution eligible to receive FAPESP funding. Researchers should meet the FAPESP eligibility requirements for either Thematic Projects (http://www.fapesp.br/176) or for Young Investigator Awards (http://www.fapesp.br/en/4479). São Paulo state researchers must send the documents as described in item 9.1 (Eligibility Pre-consultation) of the FAPESP call published at http://www.fapesp.br/biota/dimensions-NSF2018 no later than 4 January 2018 to assess eligibility as a PI for a FAPESP Thematic Project or Young Investigator award. Please note that for Dimensions of Biodiversity competition only, FASESP will consider Young Investigator Award proposals with a duration of 5 years. For FY2018, a new US-South Africa partnership will support research projects that integrate the three dimensions of biodiversity as described in this solicitation. The deadline for NRF is 28 February 2018. For US-South Africa Collaborative projects, NSF will fund up to $2,000,000 to support the activities of US researchers and NRF has agreed to provide up to 10,000,000 Rands to South African participants. The proposal budget submitted to NSF should include only the costs of US participants; the anticipated budget for South African participants should be submitted as a supplementary document. NSF and NRF will each independently review proposals and then come to agreement about which projects to support. NSF will manage the review of US-South Africa Collaborative project proposals in accordance with NSF policies and procedures. At the end of that review process, reviews of proposals that NSF has an interest in funding will be shared with NRF, but reviewer names will be redacted. Coordinated support will be arranged for successful proposals by the participating organizations, with NSF funding the US participants and NRF funding South African participants through its standard award process. Proposal Title: Titles of proposals submitted to the Dimensions of Biodiversity program should begin with "Dimensions: " followed by the substantive title. Titles of US-China Collaborative Research proposals should begin with "Dimensions US-China: " followed by the substantive title. Titles of US-São Paulo Collaborative Research proposals should begin with "Dimensions US-BIOTA-São Paulo: " followed by the substantive title. Titles of US-South Africa Collaborative Research proposals should begin with "Dimensions US-South Africa: " followed by the substantive title. Budget: Proposals Requiring Research Facilities: Budgets should include all costs charged to the project for platforms and facilities supporting the proposed research, except those facilities separately supported by NSF (e.g. research aircraft or field equipment). Principal investigators are responsible for filing the appropriate requests for major research platforms; a copy of the request must be attached as an appendix to the proposal. Each proposal that requests funding to support undergraduate and/or graduate students must include, as a supplementary document, a description of the training activities that will be provided for such individuals. The goal of the Training Plan is to prepare students to develop broad hypotheses and to become well versed with all aspects of inter-disciplinary biological research. This may be accomplished, for example, through lab rotations among PI institutions, cross-training plans, and/or integrative training workshops. NSF believes that student research experiences have their greatest impact in situations that lead the participants from a relatively dependent status to as independent status as their competence warrants. A training plan must be included that explains the approach, depth and breadth of instruction. The training plan must not exceed two pages. Proposers should describe specifically how the proposed training plan will enhance the future workforce for the field of biodiversity science and how trainees will be better able to engage in emerging research areas employing newly developing methods and tools. Only one Student Training Plan should be submitted for each project, even if it is a collaborative project. From: ___________(Printed name of the individual collaborator or name of the organization and name and position of the official submitting this memo). If the proposal submitted by Dr. [insert the full name of the Principal Investigator] entitled [insert the proposal title] is selected for funding by NSF, it is my intent to collaborate and/or commit resources as detailed in the Project Description or the Facilities, Equipment and Other Resources section of the proposal. China budget: Costs for the China component of the project should be entered onto budget worksheets that conform to NSF standards. Except for justification of the requested budget, this document must not include any additional project information; all such information should be included in the Project Description. A PDF version of the form should be included as a supplementary document in the NSF proposal. An identical proposal must be submitted to NSFC by close of business on 2 March 2018. Supplementary Documents: US-São Paulo Collaborative Research Proposals. The full proposal must be submitted to both agencies by close of business on 28 February 2018. Proposals should be prepared, formatted, and submitted in accordance with the guidelines of the agency to which they are submitted, using the appropriate cover sheet and application forms. São Paulo budget: Costs for the São Paulo component of the project should be entered onto budget worksheets that conform to FAPESP standards as described by the corresponding FAPESP-BIOTA call for proposals published at http://www.fapesp.br/biota/dimensions-NSF2018. A PDF version of the FAPESP budget worksheets should be included as a supplementary document in the NSF proposal. Similarly, a PDF version of the NSF budget pages containing the cost for the U.S. components of the project should be included as a Supplementary Document in the proposal submitted to FAPESP by the São Paulo PI. Except for justification of the requested budget, this document SHOULD NOT include any additional project information; all such information should be included in the Project Description. Biographical sketches of South African senior personnel: Those biographical sketches must conform to NSF format and limitations as described in the PAPPG. South Africa budget: Costs for the South Africa component of the project should be entered onto budget worksheets that conform to NSF standards. Except for justification of the requested budget, this document must not include any additional project information; all such information should be included in the Project Description. A PDF version of the form should be included as a supplementary document in the NSF proposal. Letters of collaboration: Letters of collaboration from South African scientists are required. These letters must be restricted to a statement of intent to collaborate only (follow template above). Additional information on the nature of the collaboration and the roles of the investigators should be included in the Project Description. Institutional endorsement: An institutional acknowledgement of the submission must be a signed letter from an authorized South African institutional representative with the following text: "I confirm on behalf of [insert name of institution] that the U.S.-South Africa Collaborative proposal between [insert name of US PI and institution] and [insert name of South African PI] is endorsed and has been submitted by [name of Research Office]." An identical proposal must be submitted to NRF by close of business on 28 February 2018. Single Copy Documents: Collaborators & Other Affiliations (COA) information specified in the PAPPG should be submitted using the instructions and spreadsheet template found on the Collaborators and Other Affiliations Information website. Please note that proposers using the COA template for more than 10 senior project personnel will encounter proposal print preview issues. Please see the COA website for updated guidance. Personnel List Spreadsheet. The template found at https://www.nsf.gov/bio/deb/debpersonnellist.xlsx, contains a single tab. Please read the instructions carefully and follow guidance. Using the template, compile an Excel Workbook that provides information for all persons listed on the Personnel page of the project description. The completed file must include the FastLane proposal ID (Not the Temporary ID #) assigned after submission of your proposal. The completed file should be submitted by email to dimensions@nsf.gov within one business day of proposal submission. US-China, US-São Paulo and US-South Africa Collaborative Research Projects will also be reviewed with respect to the extent to which they demonstrate substantial collaboration between the US and China, US and São Paulo, or US and South African partners and enhance research on the dimensions of biodiversity. The most competitive projects will be those in which the international collaboration brings substantial additional value to the project. Also as a condition of funding, any phylogenetic character matrices and trees must be formatted and deposited for inclusion within the Open Tree of Life, funded by the AVAToL program at NSF (see http: https://blog.opentreeoflife.org/data-sharing/ for instructions).